Border Guards overnight Motzoei Shabbos prevented what officials said was one of the biggest-ever agricultural theft operation seen in Israel. Security officials arrested 67 illegal Arabs, 40 of them children, who were busy raiding produce from the fields and warehouses of Moshav Shekef in southern Israel. Officials were alerted by a resident who was driving by and noticed the unusual activity in the fields, and when officials arrived they found dozens of illegal Arabs working in the dark, pulling grapes and tomatoes off trees and vines, and putting them into pails which were loaded onto several trucks that were on the site. The officials also found equipment that was stolen from the moshav. The Arabs were from the village of Beit Awwa, near Chevron. It is not clear how they entered Israel. Officials said that they had managed to steal 31 tons of produce from the moshav. Most of the produce was still on site, and was returned to farmers. The 40 minors were sent back to Beit Awwa, and the 27 adults were arrested. Four vehicles belonging to the thieves were seized. Officials said that the thieves had caused a great deal of damage to the moshav, destroying trees and and plants as they worked in the dark. 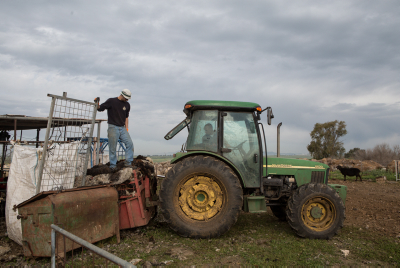 A recent Knesset session was dedicated solely to the problem of “agricultural terror” – attacks and thefts by Arabs on Israeli farms and herds – and weighed the possibility of compensating Israeli farmers for their losses, as victims of terror attacks are compensated. A Knesset report on the incidents shows that fires at farms and orchards, and theft of livestock and cattle, happen on a regular basis, and on a large scale. In recent weeks, there was a major fire in a packing house in the Galilee town of Yesod Hamalah, causing damage of NIS 10 million ($2,863,320). Another attack on Kibbutz Revivim in the south destroyed millions of shekels worth of produce. According to the report, losses due to these activities amount to as much as NIS 900 million ($25,679,710) a year. Despite this, few of these crimes are prosecuted.